2011.12.06 蒲焼 / Grilled eel (conger) Japanese style!! 蒲焼 / Grilled eel (conger) Japanese style!! We went to the fish arketto get a conger (congrio - a kind of eel). But today is monday, the most of the stands at the market were closed. We found only 2 stands were open and we got a congar (1.8kg for 5,000 pesos). Now Yutaka can go ahead with his plan to make "Grilled eel". But the conger looked more like a moray to us. On the way back to the hostel, we went to the bakery "Bimbo" to get our breakfast as usual. 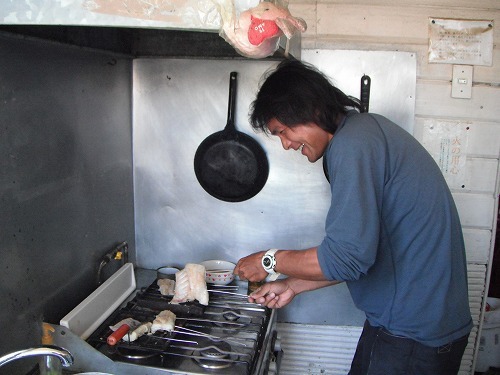 After breakfast, Yutaka started to open the conger, but he wasn't sure how he should do. Anyway, he is the man who can make impossible into possible and he did it well. He griled the conger and Ryu made the sauce. We soaked the grilled conger into the sauce and left it till evening. Hopefully it will turn out to be good. Ryu cooked "Oyako-don" (Chicken and egg cooked in Japanese sauce on top of steamed rice). As usual, his recipe was excellent. In the afternoon, I wrote down those information for next destinatin from the information books. Then I started pack up my lagguages. Then, we will cook the grilled eel (conger) Japanese style for dinner. How it will be!?? We re-grilled the marinated eel and applied the sauce over and over again. It smelt very good and then we had it. But, it tasted like cod rather than eel... It was not that but it was nt worth spending so much time. Tomorrow I will leave here, but I am not sure how far I will ride tomorrow. We went to the fsh market and bought 2.5kg of salmon and 2kg of sea snails. Back to the hostel and we went to the supermarket "Santa Isabel" to get some rice and so on. 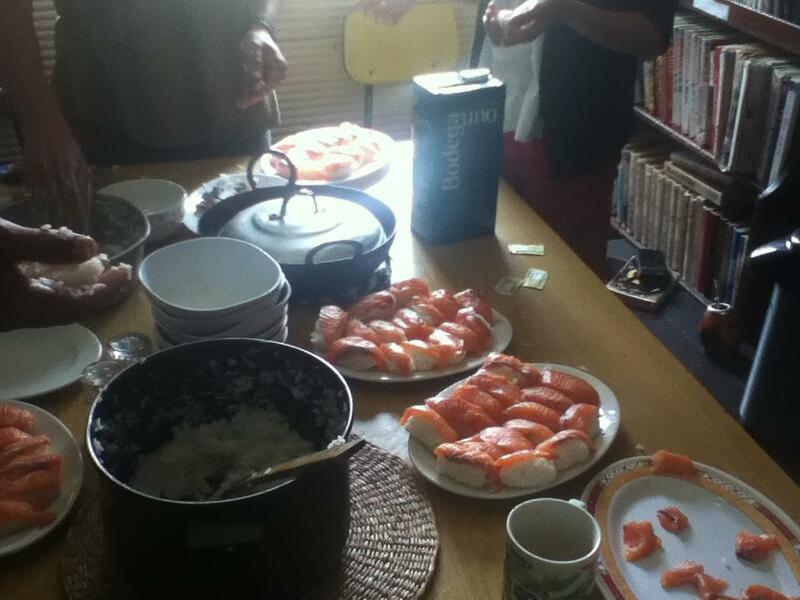 Then we all made sushi together. Yutaka was making extra large sushi again. He said "The bigger the better". We made some "bombs (lots of wasabi in sushi)", but somehow Shintaro ate them all. After having sushi, we had the lazy afternoon again. We grilled rest of the salmon for dinner. It was good but we all think we don't want to see salmon for a while. We ate too much. 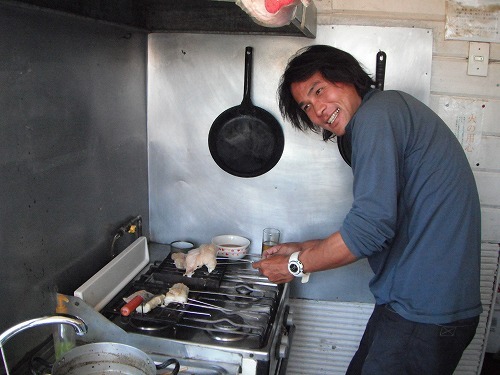 Shintaro found a recipe of grilled eel (conger / congrio) from the information notebook and Yutaka said he want to have one. So we decided to stay 1 more day. I went to the fish market with Yutaka this morning. We bought 1kg of Salmon. Ryu could not wake up as we guessed. As usual, we went to the bakery "Bimbo" to get our breakfast. After breakfast, I took a shower and did my laundry. My Keen sandles got stink somehow, so I soaked them into diluted chlorine. Hopefully this will get rid of the smell. Ryu woke up around 10am, so we went to the supermarket "Santa Isabel". We decided to grill the salmon for lunch and make salmon hot pot for dinner. When we came back from shopping, Shintaro was there. Heis from Nagoya and had been to South East Asia, Australia and Pacific islands. We had grilled salmon together. 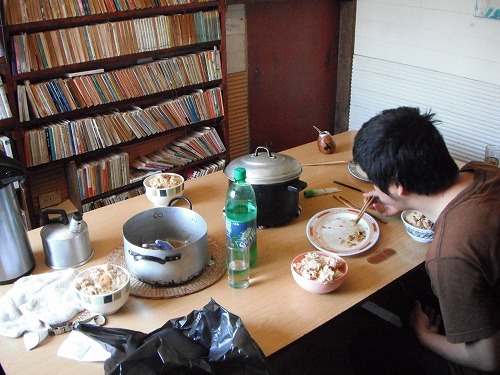 After having a nap, we cooked the hot pot. Ryu's recipe was excellent. I was thinking to leave here tomorrow, but Yutaka wants to have salmon sushi again, so we decided to stay 1 more day. With Yutaka, I went to the bakery "Bimbo" again this morning. This became our routine now. After breakfast, I did my laundry. Preparing for moving on. Then we all went to the supermarket "Santa Isabel". It was cloudy this morning, but it got better from the afternoon. We made hot dogs for lunch. We ate abocados with soy sauce and wasabi. It tasts little like tuna sashimi. Then we cooked stir fried pork with giner sauce. Ryu's receipe was excellent. We reckon each houshold needs Ryu. I was thinking to leave here tomorrow, but Yutaka wants to eat salmon again, so we decided to stay 1 more day. It's December. Just 1 more month, this year will end. Time flies. Yutaka and I wanted to go to the fisk market but it was sprinkling, so we just went to the bakery "Bimbo" to get our breakfast. After having breakfast, we took a metro to Valparaiso. I went to a post office to sent used maps and a DVD to my home. Then we went to the supermarket "Jumbo" to get some foods for our trip down south. We cooked pasta for lunch. As it was clouded whole day, we just chat in the hostel. I am thinking leaving here the day after tomorrow. Ushuaia is waiting for me.